Boston University's Joel Farabee during a game in January. Left winger Joel Farabee is turning pro and hopes to earn a spot with the Flyers during training camp. That’s the goal, Farabee, who starred at Boston University as a freshman this season, said in a telephone conversation Monday. 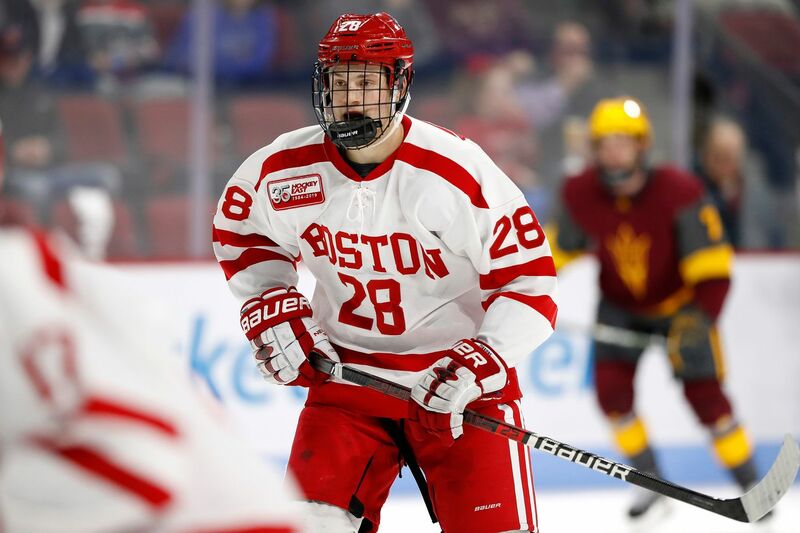 The Flyers signed the speedy Farabee to an entry-level contract Monday that will take effect at the start of the 2019-20 season, general manager Chuck Fletcher said. The three-year deal is expected to be worth $925,000 per season, the maximum entry-level contract. Farabee will start next season either with the Flyers or the AHL’s Lehigh Valley Phantoms. “It was a great year at BU, but I’m excited to go pro and see what happens from there,” Farabee said. “I’ll see where I fit in at camp and go from there, whether it’s with Lehigh or hopefully with the NHL club." Farabee, a Cicero, N.Y., native, says he can help the Flyers. Drafted in the first round (14th overall) last year with one of the picks the Flyers received in the 2017 trade that sent Brayden Schenn to St. Louis, Farabee appeared in 37 games this season for Boston University and was named the Hockey East Rookie of the Year. In the Schenn deal, the Flyers also acquired a 2017 first-round draft pick that turned out to be gifted forward Morgan Frost, who will be battling for a roster spot next season. As a freshman this season, Farabee led Boston University in scoring with 17 goals and 19 assists for 36 points. He also led the team in plus-minus (plus-4), shots (131), shorthanded goals (three), and game-winning goals (five). He tied for the team lead with five power-play goals. Farabee, regarded as a strong playmaker and two-way player, also helped Team USA win a silver medal in the World Junior Championships. When the Flyers drafted Farabee in June, he was listed at 6-foot, 162 pounds. He is now 6-1 and has bulked up to 174 pounds. “I think playing a year in college definitely helped me get a little stronger and work on my down-low game,” he said.